Visitors to Cold Spring Harbor’s Community Beach may be hard pressed to imagine the industrial bustle that once characterized the area. For 175 years, the spit of land now known as Eagle Dock Community Beach was a center of commercial activity. With the removal of the oil storage facility to the north of the beach, the area is returning to its bucolic past. The east side of Cold Spring Harbor was known in the nineteenth century as Clamtown because of the abundance of clams found in the local waters. Oysters were also harvested here. But it was commercial activity that defined the area. As early as the 1830s, a steamboat dock was built near the north end of the spit of land known as Middle Beach—now the site of the community beach. Walter R. Jones and John H. Jones acquired this parcel and the adjoining land to the north from the Huntington Board of Trustees in 1837. The outline of the dock can be seen on the 1837 Coastal Survey of Long Island. From this dock, the steamboat American Eagle made three trips a week into New York. The side-wheel steamboat carried passengers and freight on its regular run and also was used to tow whale ships in and out of the harbor when tides and wind conditions required. One passenger in 1843 wrote of his trip aboard the American Eagle. The ship left Cold Spring Harbor at 5:00 on a Monday morning. There were stops in Oyster Bay, Glen Cove and New Rochelle before reaching Fulton Market pier at 9:30. During the four and a half hour ride, the passengers enjoyed a hearty breakfast and a very good cup of coffee—“the best cup of coffee that is made in the ‘nine counties’,” according to the correspondent. The American eagle depicted in a recent painting by artist Bill Jonas. But Middle Beach had not been abandoned. Around 1860, John P. Dole established a ship salvage yard south of the old steamboat dock. Over the next 25 years, Dole would purchase old wooden boats, some from the U.S. Navy, and salvage what useable material he could. The most valuable commodity was the metal hardware. Larger timbers were used to build houses. After all that could be salvaged was removed, the ship’s carcass was burned. The spectacular fires drew large crowds along Shore Road. Reportedly, Cornelius Vanderbilt’s famous yacht, The North Star met its demise at Dole’s Beach. By the 1870s, Cold Spring Harbor had become a resort community. Grand hotels—Laurelton, Glenada and Forest Lawn—and smaller boarding houses attracted New Yorker seeking to escape the heat of the city. What better way to start a vacation than with a steamboat ride? With that in mind Dr. Oliver Jones decided to rebuild the old steam dock, this time with a causeway across the cove to reach shore road. At the time, the cove extended as far north as the present day Beach Club property. Dr. Jones, whose obituary noted he had a hobby of building new roads, planned to extend the road through a ravine and on to Huntington village two miles away. The road was never completed east of Shore Road. Dr. Jones used bricks from his yard at West Neck for fill, which explains the plethora of bricks in the area where the dock had been. 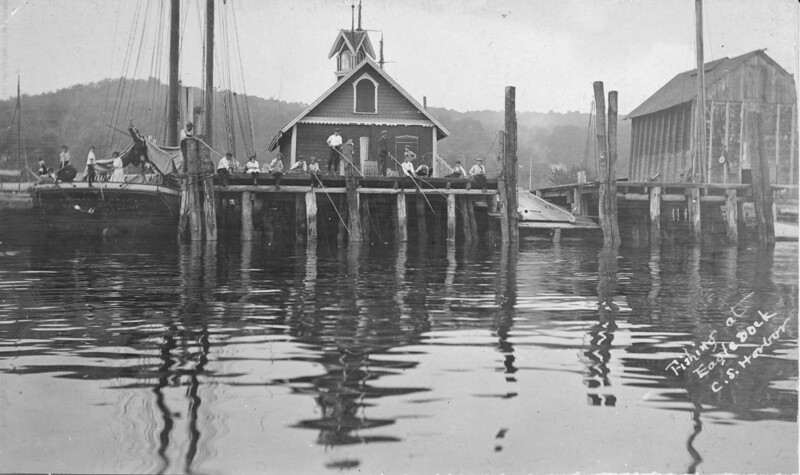 The new dock was completed in 1885 and was named “Eagle Dock,” undoubtedly in honor of the first steamboat to ply Cold Spring Harbor’s waters. On the dock—which was really more of a bulkhead pier—was a freight house. The steamboat Sylvan Dell made the trip from Eagle Dock to Pier 23 in New York in two hours and fifteen minutes—half the time it took the American Eagle­ forty years earlier. A few years earlier (1881), Elwood Abrams leased from Charles H. Jones the land north of the dock for use as his shipyard. He had arrived in Cold Spring Harbor in 1868 and operated a shipyard further south on the harbor. Abrams eventually added a saw mill. He lived across Shore Road and there he operated an ice cream, soda, candy and tobacco store as well as a boarding house. William Bingham and Benjamin Brush opened a grocery store near the present site of the crew team’s boathouse in 1890. Bingham also had an ice house and imported ice from Maine when the local ice crop failed. A gentleman named Mason converted the old sail loft and ice cream saloon at Eagle Dock into a dance hall in 1891. Mason’s Eagle Dock Pavilion became a popular social gathering place. In the late 1890s, T. Wilson Gildersleeve had a bowling alley at Eagle Dock. But it wasn’t until 1957, when he was 74 years old, that Gildersleeve bowled a perfect game and that was at the Commack bowling alley. In 1896, the State fish hatchery started a lobster hatchery at Eagle Dock. When the grand old hotel, the Glenada was dismantled in 1906, the used lumber was shipped from Eagle Dock. In 1908 when William K. Vanderbilt II invited motorist from Europe and across the country to come to Long Island to race their automobiles on Long Island’s rural highways, steamboats from Connecticut and Westchester brought passengers to Eagle Dock where they were met by stage coaches to take them to see the race from Woodbury turn—the corner of Jericho Turnpike and Woodbury Road. The next year, Eagle Dock welcomed the steamer Victor, which had been outfitted to take cars across the Sound from Stamford, CT.
During Prohibition, Eagle Dock was reportedly the drop off point for hundreds of cases of illicit liquor from Canada. Meanwhile, the Abrams shipyard continued to be busy. Instead of building ships, the yard was now mostly involved with repairing yachts and storing them for the winter. Abram’s saw mill was considered one of the best and largest on Long Island. The land on which Eagle Dock and Abrams shipyard were located continued to be owned by the Jones family. The rest of Middle Beach to the south as well as the land under the cove had been acquired by Henry DeForest in 1879. DeForest acquired hundreds of acres of uplands reaching from Shore Road to Goose Hill Road. The last 31 acres of that estate is now being offered for sale. The DeForest land on Middle Beach had, according the 1952 estate appraisal of the property, “a summer beach house and shacks with no market value.” DeForest also had a small engine, known as a donkey engine, that would pull his yacht, the 8 meter sailboat Priscilla III, along rails to the beach for winter storage. Remains of the engine and rails can still be seen. The house at the north end of the DeForest property on Middle Beach (about where the “pirate” ship is today) was the home of George Shellack, who was the captain on the DeForest boats during the summer and their chauffer during the winter. There were three other buildings, all on stilts. The largest, near the donkey engine, was where all the yachting paraphernalia was kept. A second was home to two young bachelors who helped with the DeForest boats. The third is where the maids from Johnston DeForest’s house (the white house behind the pond) changed their clothes when they went to swim every afternoon during the summer. The Dole family had a boathouse on the beach between the three shacks and the Shellack’s cottage. The Deforests also had a small floating building moored along Shore Road opposite the driveway to their mansion, Wawapeck. They kept rowboats and canoes in the house, which they used to get out to the spit. The DeForest family allowed Cold Spring Harbor residents to use their beach for swimming. The Cold Spring Harbor Civic Association raised money to fund the operation of the beach. Access was across the road built by Dr. Jones to the old Eagle Dock. In July 1922, Rosalie Jones, acting as executor for her mothers’ estate, offered several pieces of land, including the Eagle Dock property, for sale. The parcel was described as being “five acres in all” so it included the shipyard property as well. Walter Abrams, who had taken over the shipyard from his father, purchased the shipyard property from the Jones family for $50,000 in October 1922. Just two years later, Abrams sold the land to the Standard Oil Company of New York for $175,000. Abrams moved his shipyard to Halesite and it is now operated by the Knutson family. Interestingly, Abrams’ father was appointed an agent of Standard Oil in 1900 for the sale of naptha, a petroleum product used as a solvent and sometimes for fuel. Local legend has it that the oil tanks were the result of the failure of the newly formed Beach Club to invite members of the Jones family to join. According to this story, Rosalie Jones convinced Walter Abrams, whose shipyard was supposedly struggling, to sell his land to her. She in turn sold the land to Standard Oil of New York, the rival of Standard Oil of New Jersey, whose president Walter Jennings was the founder of the Beach Club. But since the Jones family owned the land in 1921 when the Beach Club was formed and since the deed to Standard Oil was signed by Walter Abrams not Rosalie Jones, the accuracy of the legend has to be questioned. In any event, until they were torn down in 2005, Standard Oil’s tank farm would be the last remnant of Clamtown’s industrial past. The Jones family didn’t sell the old Eagle Dock property until 25 years after it sold the shipyard property. Dolores Brock purchased and just three months later sold the land to Harry Knight and August Carbone. Four months after they acquired the land, Knight and Carbone requested that the zoning on the property be changed from residential to business. The request was not met favorably by the neighbors. Knight and Carbone intended to use the property to rent boats, sell refreshments and operate a bathing beach for profit. They promised to tear down the existing old buildings and build a new dock and a refreshment stand and some bath houses. Almost 200 people showed up for a hearing before the Huntington Planning Board in June 1948—only two spoke in favor of the re-zoning. One of the supporters of re-zoning was none other than Rosalie Jones, who had argued unsuccessfully to have the property classified as business rather than residential when Huntington first adopted zoning laws in the early 1930s. Jones noted that many in the room were not natives of Cold Spring Harbor, yet they seemed wary of any development that would attract outsiders. Opponents were led by Johnston DeForest, who was one of the members of the commission that first proposed that Huntington should adopt a zoning ordinance. Where Knight and Carbone saw a refreshment stand, opponents saw a bar. Some saw the opposition as an attempt by wealthy residents to keep regular folks away from the town’s beaches. After a summer of controversy, the application for re-zoning was denied. On September 23, 1948, 42 concerned residents gathered at the home of B. Tappen Fairchild on Shore Road. They resolved to form a charitable organization to purchase the Eagle Dock property and make it available to Cold Spring Harbor residents who did not have access to private beach facilities. At the time 80 residents had made pledges totaling $24,000. The beach would be available to residents of Cold Spring Harbor school district 8 at no charge. 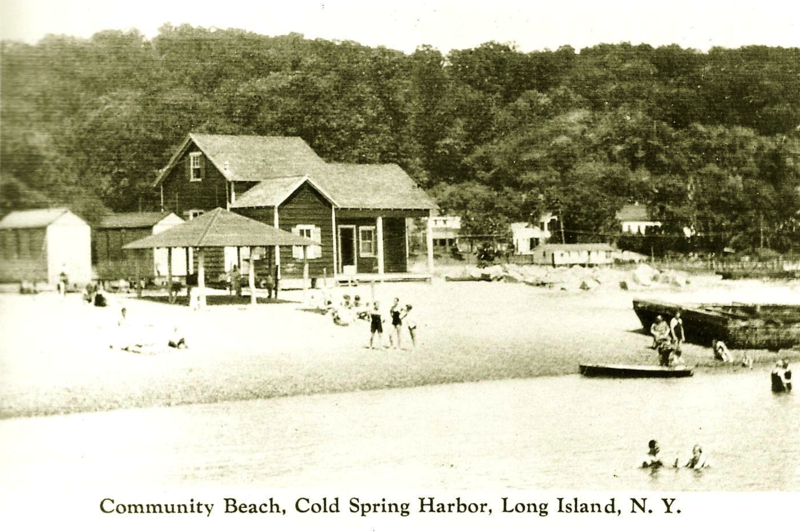 The corporation formed to purchase and maintain the beach would be “charitable and educational and exist for the general welfare of the people” of Cold Spring Harbor. To establish, equip, maintain and operate a public beach, playground and bathing facilities for the children and other residents of Cold Spring Harbor School District No. 8, to create and promote better under-standing and sympathy between the people of the community and to further the general welfare and health of all the people in the said School District. The next month they purchased the 1.1-acre Eagle Dock property from Knight and Carbone for $22,293.11. It was reported that Knight and Carbone managed to turn a nice profit on the sale. In addition to the Eagle Dock property, which only included the roadway and the area between the current split rail fence and the Standard Oil property, the Foundation entered into a lease with Johnston DeForest for part of his property on the spit—the area up to the line of boulders near the current floating dock. The rent was one dollar a year. An early concern of the donors was the tax-deductibility of their gifts. They were advised that no assurances could be made concerning deductibility, but that they should nonetheless claim the deduction on their tax returns. The IRS initially refused to allow the deduction. But one of the original supporters, Isabel Peters, pursued the case in Tax Court and in a landmark case finally prevailed in 1953. The IRS was reluctant to accept the outcome, but acquiesced six years later. The committee relied on volunteer labor and volunteer contributions. In 1951 a new bathhouse, about the size of a garage, was built. Water was provided by Standard Oil from its property at no charge to the beach. On a year-to-year basis, beach privileges were extended to residents of school district 11 in Suffolk County. School district 8 was the old East Side district, while district 11 was the West Side district and also included Laurel Hollow. Over the years, the Foundation was concerned that Cold Spring Harbor’s growing population might preclude extending these privileges to district 11 residents. The border between the two districts was just north of Lawrence Hill Road. But eventually the privilege was made permanent. In 1953, 195 families provided support for the beach, a second life guard was hired and the beach was opened seven days a week instead of just six. Beach finances relied on voluntary contributions from residents, all of whom were issued admission cards. Boy Scouts distributed pledge cards, but donations were slow to arrive. It was not until 1961, that stickers were issued for the privilege of parking at the beach. The shore route should not be chosen because it will destroy or impair the natural harbor which is the principal physical asset of the area. The choice of the shore route does not take into account developments in transportation, such as monorails, helicopter, or hydrofoils, which may well be better methods of transportation to the new park before any route can be completed, and which would better serve the new park without spoiling the adjoining area. The choice of the shore route, and the substitution of other property for the property presently owned by the Foundation, may impose annual charges for maintenance on the Foundation which it will not be able to meet. The shore route raises practical problems regarding water and electric lines, the solution of which is unclear. The issue was discussed every year at the Foundation’s annual meeting into the early 1970s, but no further information was provided by the Parks Commission. Perhaps bearing in mind that Sunken Meadow Park opened in 1929, but the parkway leading up to it was not completed until 1957, the Foundation’s ongoing concern was justified. The threat was not removed until 2004 when the Cold Spring Harbor Library secured a long-term lease from the Parks Commission for five acres on the proposed parkway right of way. With the community’s library standing in the way, the parkway would not be built. Even with the uncertainty presented by the proposed parkway, the beach thrived. But by the 1980s, the beach was at a crossroads. The dock built on the old pilings was destroyed by winter storms in 1981. A floating dock was built to replace it. In 1984, a reorganized and re-energized Management Committee announced plans for a major upgrade of the beach, including “dock restoration, landscaping, security enhancement, bathing beach improvement, and building restoration and improvement.” The community responded to appeals for donations to realize these plans. In 1986, the beach made several strides. The sail locker was built and the floating dock was completed. But the most important development was Priscilla DeForest Williams’ decision to donate the rest of the spit as well as the land under the Cove and land on the water side of Shore Road to the Foundation on the condition that the land be kept forever wild. Throughout its history, Eagle Dock has been a place for Cold Spring Harbor residents to socialize with their neighbors. A long-standing tradition is the annual clambake in August. Over the years other events have been added to the calendar: Field Day, the Sunday Brunch, Dancing Under the Stars, S’Mores to mark the end of the school year, Wine & Cheese night, and even potluck parties. In keeping with the terms of its charter that the beach was for the children of the community, in 2001, the Foundation entered into an agreement with the Cold Spring Harbor Rowing Club, the sponsor of the high school’s crew team. Pursuant to the agreement, the Rowing Association constructed a boathouse and uses Eagle Dock for its practices. The arrangement allows for greater use of the beach by the children of the community, without interfering with the swimming and boating that have always been the focus of beach activities. The mission of Eagle Dock Community Beach is to establish, equip, maintain and operate a public beach, playground and bathing facilities for the children and other residents of Cold Spring Harbor and to promote a better understanding of the marine ecosystem of Cold Spring Harbor, including our beach and its surrounding coastal environs. Eagle Dock Community Beach is dedicated to the protection of the marine ecosystem of Cold Spring Harbor in order to facilitate our continued access to a healthy waterfront. Through the conduct of environmental education programs, our community is engaged in the stewardship of this important natural resource. Environmental education programs have proven very popular and will help to ensure that the community remains sensitive to the need to protect its harbor. Although the removal of the oil tanks was a welcomed development, the removal of the oil dock has accelerated erosion of the beach property presenting new challenges. But with the community support Eagle Dock has enjoyed for the past sixty plus years, it is certain that the people of Cold Spring Harbor will continue to have a beach to call their own.